In the spruce and fir thickets of the White Mountains, trails had to be cut to allow down-mountain skiing, and in 1946 the oldest trails were not yet fifteen years old. Bradley and Hannah were both innovative thinkers who would leave their mark on the soon-to-be business of skiing, Hannah as a ski resort planner and Bradley as the manager of Winter Park, Colorado and the inventor of the Bradley Packer, an early ski grooming contraption piloted by a single skier. Some of the earliest glades for skiing on record were created in the Mid-Atlantic region, not New England. The Ski Club of Washington, DC worked with the National Park Service and the CCC to create a slalom glade at The Pinnacles along Skyline Drive in the Shenandoah National Park, Virginia about 1938. “Roland Palmedo went around propounding his theories about slalom glades until people began to build them”, noted the ten-year anniversary booklet of the Amateur Ski Club of New York, Palmedo’s club. Good skiers in the Alps, and in the western US, did not need to think about actually cutting trees to create skiable glades, due to the widely-spaced nature of the forests there. 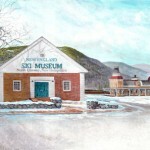 The first glade skiing in the eastern US was on Mt Mansfield, Vermont, where skiing took hold in the 1930s. The Nose Dive, cut by the Civilian Conservation Corps in 1934, was a steep, narrow trail, and started with the twisting Seven Turns. Below these tight, difficult corners, to the skier’s left was a patch of skiable trees named the Slalom Glade, which appeared on the trail map in 1940. In April 1937, these trees were skied by two devoted Mansfield skiers, Charlie Lord and Ab Coleman, who laid out the Nose Dive, supervised its construction, and made many climbs up the trail before the Mt Mansfield chairlift was installed in 1940. 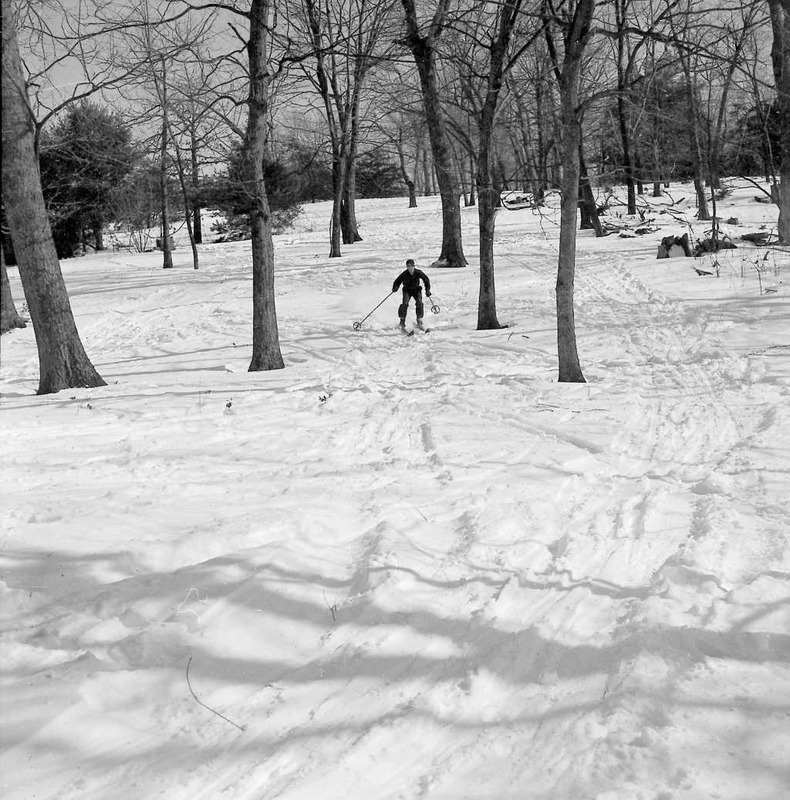 Lord’s notes written in that year mention the glades—“underbrush cut and large trees pruned”, creating “about twenty acres of beautiful woods skiing”, probably cut in the summer of 1940 in anticipation of the advent of the chairlift. Something about the geology of the Green Mountains favors mixed open hardwood and softwood forests that are well-suited to open glade skiing, a blessing that New Hampshire and Maine do not enjoy. 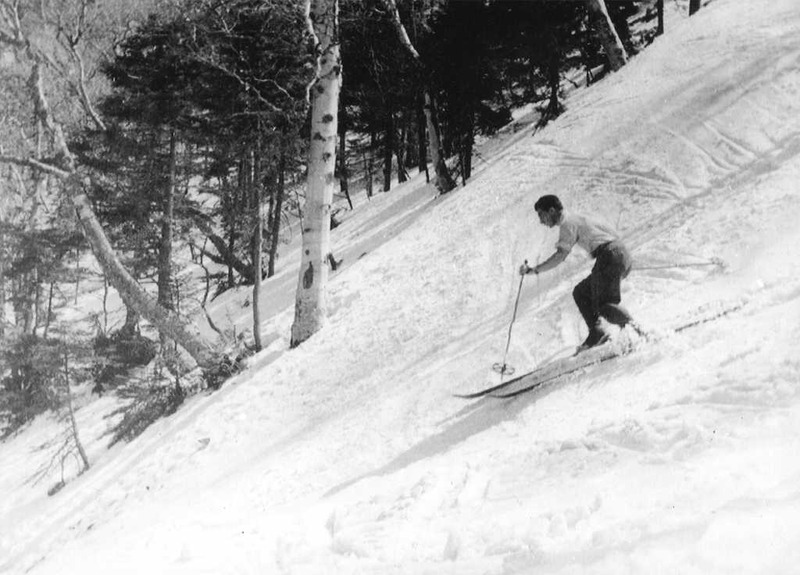 Mad River Glen, developed by Roland Palmedo and Charlie Lord with the benefit of their experience at Mt Mansfield, had stands of mature hardwood forest that was eminently suitable for tree skiing. In the summer of 1952, a run named The Glade was cut, with large trees left in place as the underbrush was removed. Other parts of the mountain were skied informally from the beginning of the area, and brush there was pruned by Mad River homeowners who formed surreptitious work parties, most notably in the area that became known as Paradise. Beginning in the early 1960s, some ski areas incorporated glades into their formal construction plans. “To me, the father of glading was Real Boulanger of Mont Sutton,” says Joe Cushing, a partner with Sel Hannah in the Sno-engineering firm. “When we did the work on the Outback section of Keystone, one of the things John Rudder said to us was ‘I want some glades like Real Boulanger has.’” Boulanger’s method of glading was simple, according to Cushing. He would cut a few trees out that he knew would be in the way, let people ski it for a season, then, “every tree that has blood on it, I’m going to take out.” Cushing also recalls glades being cut at Glen Ellen, Vermont, now part of Sugarbush, during its original construction in the early 60s. Gladed skiing has since become a popular option at many areas, as skiers seek something out of the ordinary, and often, better snow conditions in the protected woods. The next phase of the evolution of tree skiing may well be underway at Mad River Glen. After the devastating ice storm of 1998, when forests across northern New England suffered widespread damage, Mad River instituted a Forest Management Plan to effect recovery of their tree skiing areas, and to ensure that the glades of General Stark Mountain would remain glades, not gradually become open trails as older trees die off. Using regeneration zones where skiing is not allowed and advice from professional foresters, they hope to maintain the long-term viability of their woods skiing. There seems to be remarkably little documentation on the early thinning of glades for skiing, perhaps because many began as grassroots efforts on the sly. As skiers grew bored with snow surfaces created by snowmaking and grooming, and as ski equipment allowed more people to ski well, off-trail skiing grew popular and area operators acquiesced in the trend, putting their glades on the trail map. As for Bradley’s hope to see tree skiing south of the Aerial Tramway at Cannon, the terrain he envisioned in his 1946 letter to Hannah was gladed in recent years and is shown on today’s Cannon trail map as Kinsman Glade.